"China's Striking Anticorruption Adventure: A Political Journey towards the Rule of Law?" Introduction: China is a high-corruption country and the ruling Communist Party (“the Party”) has made anticorruption enforcement a top priority. China is also well known for her authoritarian decisiveness in policy making and her effectiveness in policy implementation with a centralized political control contrasting sharply with a decentralized economic policy. This chapter examines two key aspects of this formulation. First, how has the authoritarian characteristic affected China’s anticorruption enforcement; and second, how is China different from other countries, authoritarian or otherwise, in this regard? There has been an ongoing debate between a “convergence theory” and a “divergence theory” on China’s political-legal development. According to the convergence story, nations different in their level of legal development largely because of the different levels of economic growth. China is significantly different from high-income countries because China, as a middle-income country, lacks resources and capacity to support an advanced system. But as China progresses economically, social and legal changes are bound to follow. Consequently, gaps in the legal system will be filled, and the distance between a mature legal system and an emerging legal system will be narrowed. Substantive convergence is the destination of all legal systems even though it may appear in different forms. There is an incremental trajectory along which nations develop their legal system, in a thin sense, and while sequencing in a certain sense may be important, all nations can achieve that trajectory once the necessary conditions are present. In the anticorruption field, the Party proves to be resolute and innovative in designing anticorruption strategies and has demonstrated both the will and ability to put corruption under effective control by resorting to measures that are not fundamentally different from international best practices. While the divergence theory has a long spectrum of arguments, its central argument is that China has a unique system that renders convergence impossible. In Minxin Pei’s cynical formulation of a “trap thesis”, China’s political model suffers from fatal flaws and is not self-correcting. 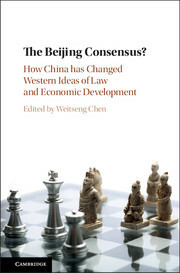 Following a liberal line of conceptualization, Pei argues that, without meaningful political competition, separation of powers, independent legal institutions and active participation from the civil society, China is unlikely to overcome its corruption problem that is inherent in the authoritarian system. As a result, the regime becomes increasingly fragile structurally as it sinks deeper into a trap. Any incremental reform, which may prolong regime survival, cannot lead to a fundamental political transformation. Consequently, Pei provides a provocative and dim view of political corruption in China. He concludes that corruption will continue to entrench itself and the anticorruption mechanisms that rely on the Party’s internal disciplinary framework, without the support of law and legal institutions, will not be able to stop the further spread of the trend. As a result, the regime must collapse on tis own weight before any transformation can occur. Pei’s trap thesis has been shared by many others who, in various ways, present a China-collapse thesis. Others have turned Pei’s thesis on its head and argued that what appears to be fatal for Pei is precisely where China’s strength lies and contributes to China’s authoritarian resilience. Striking a positive note, many have argued that, instead of converging into a Western political model, China may have discovered a distinct development model based on its effective and decisive political leadership or communitarian social structure. China’s anticorruption efforts deliver precisely because it is led and controlled by the Party at the macro-level. This anticorruption model is legitimate and effective because it is embedded within the Chinese reality and the cultural milieu. Seen from this perspective, China’s political system, including its anti-corruption regime works effectively in these Chinese circumstances. This chapter discusses China’s anticorruption enforcement within the context of the convergence/divergence debate and examines the degree to which the Chinese anticorruption model converges or diverges from the prevailing “international best practice” that is commonly observed in the high-income/low-corruption countries. Specifically this chapter will also discuss whether China could develop an anticorruption system that operates within a rule-based legal framework. The principal argument is that China’s anticorruption practice manifests certain core features that may be unique to the Chinese political context and those features show most strikingly at the height of an anticorruption campaign. But if we look beyond an exceptional “strike-hard campaign” that targets the “tigers”, shift the focus to the more routine enforcement against “files” and in particular, observe China’s anticorruption enforcement for a longer time span, it becomes clearer that China does not operate an anticorruption model sui generis. As the anticorruption storm dies down (as it will naturally occur), the enforcement will become more routine, regularized, and institutional. When that happens, the Chinese anticorruption model, if any, will appear no different from models elsewhere. This chapter is divided into five parts. Following this introduction, Part II introduces, in broad strokes, the core features of the internal disciplinary inspection committee (jiwei) of the Party. Jiwei has come to political prominence in the Xi government and is becoming the most powerful force in the Party apparatus. This part explains the political meaning of Party discipline and the core institutional design that renders the mechanism effective. Yet, despite the ostensible politicization of anti-corruption, the jiwei mechanism, shares some core characteristics with the most successful anticorruption stories in other authoritarian systems that one may observe in Hong Kong or Singapore. Part III then moves beyond jiwei to study the much marginalized and neglected legal anticorruption system in China and its interaction with jiwei. While fundamental differences between the two systems remain, they have, over the years, moved closer to one another and have the potential to replicate each other’s structure and modus operandi. Part VI examines the anticorruption mechanism from a historical perspective and offers insights on the degree to which law is relevant to anticorruption enforcement. Part V concludes this chapter... Click here to download the chapter from SSRN.